You probably missed the following little news item, lost in all the screaming red headlines of recent days. It has important implications for our understanding of what our so-called Clean Energy Future will really look like, under the government’s carbon pricing scheme scam. Because as we have previously seen from the details buried in the government’s official website, their “carbon pricing mechanism” is nothing whatsoever to do with “saving the planet”. Instead, it is all about preparing the way for international banking’s latest casino – carbon dioxide futures and derivatives trading. A mega-casino with trading via the bankers favourite new toy, HFT (High-Frequency Trading) – advanced computerised platforms directly linked into the stock exchanges and able to execute fully-automated trades in under 10 milliseconds. Some trades in the Australian listing of Rio Tinto are under investigation after the company’s stock lost nearly 98 per cent in four minutes and briefly dropped to its lowest level since the 1970s, the Australian Securities Exchange said today. A series of trades between 11:24 and 11:26 AEST are being investigated, the ASX said. Exchange data shows a series of equity options combinations were traded at $1.43 to $1.91 between 11:24 and 11:26 AEST against a typical price of around $71.00 per share. A total of $489,981 in shares were shown changing hands at the subdued prices, giving an average price of $1.81 per share. However, a trader at Goldman Sachs said the stock had not actually reached that level. “It had something to do with some derivatives and I’m sure it will be unwound later in the day,” said the trader, who didn’t want to be named. … automated trading programs have been known to cause rapid and short-term fluctuations in the prices of securities or so-called “flash crashes”, which have become an increasingly-noticed feature of financial markets. “It had something to do with some derivatives…”. Regular readers may recall my analysis of the government’s newly-announced “carbon pricing” scheme on the day after Carbon Sunday – Our Bankers’ Casino Royale – “Carbon Permits” Really Means “A Licence To Print”. They may also recall my follow up article only a few days later – I Was Right – Our Banks Begin Preparing Carbon Derivatives Market. Now, one could try to argue that the government’s documentation quoted above and in more detail in my analyses, does not actually use the specific word “derivatives”, or “futures”. And so, one could try to argue that I have no concrete proof. That I have simply inferred that “creation of equitable interests” and “taking security over them” means “derivatives”, but if the government has not used those exact words, then I might just be making it all up. Dear reader, if there is any lingering doubt in your mind that the Green-Labor government is setting up a scheme purposefully-designed to serve as the basis for carbon derivatives and futures trading, then doubt no longer. In consultations undertaken on this issue for previous proposals, most stakeholders supported the auction of future year vintages as future vintages may be an alternative to the spot market and any associated derivative markets for liable entities seeking to manage future emissions obligations. Advance auctions of future vintages are not required for carbon futures prices to emerge. For example, derivative markets have developed in the European Union Emissions Trading Scheme without advance auctions. The preferred position is that there will be advanced auctions of future vintage permits. The government’s scheme is all about putting in place the necessary laws to allow banksters the legal right to create trillions of new carbon “securities” – that is, new carbon derivatives, and futures “products”. The kind of “products” that lead to “flash crashes” which can wipe out 98% of the sharemarket value of one of the world’s biggest mining companies in less than 4 minutes. And do not doubt for a moment, dear reader, just how many carbon dioxide derivatives the bankers can (and will) create. 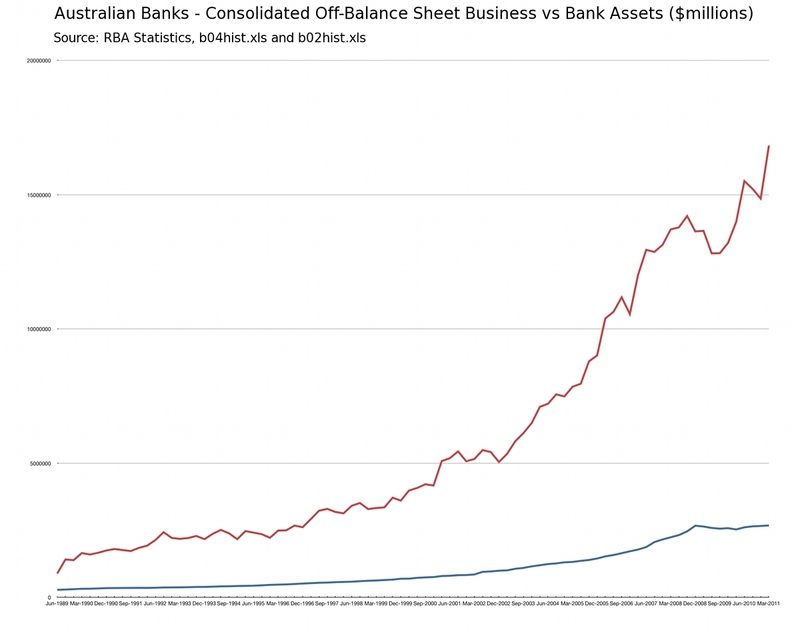 That’s $16.83 Trillion in Off-Balance Sheet derivatives “Business” (red line), versus only $2.68 Trillion in On-Balance Sheet “Assets” (blue line) – 2/3rds of which “assets” are actually loans. According to David Bloom, global head of HSBC Foreign Exchange, our banks are racing towards “a bigger Armageddon” in foreign exchange markets … and they are racing towards it sitting atop that monster red line mountain of derivatives bets. Try to imagine if you will, just how many derivatives that international (and local) bankers will create on top of the underlying “value” of Australia’s $23 starting price carbon “permits”, from the moment that the Brown-Gillard economic planking platform is rammed through Parliament. And then, think carefully about the words of that Goldman trader just a couple of days ago, when one of the world’s largest miners almost vapourised off the sharemarket in 4 minutes flat. “It had something to do with some derivatives”. Corruption of solar science and personal attacks have been used decades to promote the global climate scam. c.) The threat of Mutual Nuclear Annihilation. The Bilderberg Model of a “homogeneous Sun in hydrostatic equilibrium” – adopted at the Bilderberg in April of 1967 – became official government propaganda after the 1971 meeting. I’m getting nervouser and nervouser…..
I’m starting to sound like a pornstar saying “OH MY GOD!” every 30 seconds, except the ending ain’t gonna be nearly as happy! It’s unfortunate that this very very important issue was not presented in a more comprehensible manner, people get carried away with words of fill in “chatter”. i am sure it could be reduced to a single printed page, and in language more suitable for the “masses”.Wall street speak of technical detail confuses people, this matter is too important not to be understood. Warren Roche.. Thanks Warren … you are more than welcome to write up a Guest Post on this topic, and explain it better for readers. Cheers.